A grim, rainy Monday outside the Lost Apartment, and I can hear the wind roaring around the upper level of the house. It is pouring here right now; the leaves are glistening with wet in the gloom–and am I ever glad I got the windows in the car fixed! Yesterday was a lovely day; I got some work done, went to Costco, and managed to finish reading Paul Tremblay’s wonderful A Head Full of Ghosts. Best-selling author Rachel Neville wears a perfect fall ensemble: dark blue hat to match her sensible knee-length skirt and a beige wool jacket with buttons as large as kitten heads. She carefully attempts to keep to the uneven walkway. The slate stones have pitched up, their edges peeking out of the ground, and they wiggle under her feet like loose baby teeth. As a child I used to tie strings of red dental floss around a wiggly tooth and leave the floss dangling there for days and days until the tooth feel out on its own. Marjorie would call me a tease and chase me around the house trying to pull the wax string, and I would scream and cry because it was fun and because I was afraid if I let her pull one tooth she wouldn’t be able to help herself and she’d pull them all out. How much has passed since we lived here? I’m only twenty-three but if anyone asks I tell them that I’m a quarter-century-minus-two years old. I like watching people struggle with the math in their heads. Earlier this year, the book won the Bram Stoker Award for Best Novel, and as I have mentioned previously, I’d started it before and got distracted and for some reason hadn’t finished it. I picked it up again last week and started at the beginning again, and this time read it all the way through. 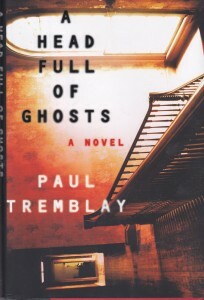 It’s an interesting book–well-written, certainly, and I also thought it was interesting the way Tremblay chose to deal with its subject matter: is Marjorie Barrett a mentally ill teenager, or is she possessed by a demon? Complicating matters is that her father is descending into religious mania, while her mother is quite rational and skeptical; and while all of this is going on the family, in need of money, has agreed to have it all filmed as a reality show, The Possession. The point of view character is the younger daughter, Merry (Meredith), who is remembering it all as it happened in two ways; she is remembering it for the afore-mentioned novelist, who is writing a non-fiction book about what happened to the Barretts, and Merry herself is writing a blog about the television show AND the case under a pseudonym for Fangoria. It’s an interesting book, and it reminded me a lot of Shirley Jackson’s We Have Always Lived in the Castle in the voice; an emotionally arrested young woman telling the story in a child-like way about what happened when she was a child, and does she have an adult voice? I’d read somewhere recently about how horror novels and films are often attacked by religious groups when the books themselves actually are quite affirmative of religion; I’ve always thought that to be true–Anne Rice’s vampire novels are actually very much about affirming Catholicism; and doesn’t almost every vampire novel, really, confirm that the symbolism necessary to defeat or keep vampires at bay those of Roman Catholicism? (Particularly interesting in that in Dracula, a Transylvanian would have been Greek Orthodox not Roman Catholic.) I don’t know enough about the genre to write knowledgeably about this, but it is definitely interesting.